The original used a dual concentric pot for the Boost/Cut and Frequency controls, but I think they are almost certainly going to be special order as one side is 50K reverse log and the other is 100K dual linear. So maybe just using two pots would make more sense for the average DIYer. The trimmer is for volume and is designed to be pretty much a set and forget. Set it for unity, or a slight boost or whatever you favour and then close up the box. Again though some people may prefer to alter it slightly, do away with the trimmer and have an external volume pot. Make sure you use 25V rated caps if you want to power it with 18V. They fit a battery, a concentric pot and this circuit in a 1590A? That's insane! Just a wording question on the Freq pot: are all 4 of those pot legs connecting together, or is it two separate connections: 1-2 to 2-2 and 1-3 to 2-3? You work fast! Going to hop on this one asap. Would love to build this, but struggling to find a Dual 50k Rev Log pot - anybody got any ideas? Thanks! I've built this and it's working, but there is a big volume drop even if I turn the trimpot to the max. Is there a way to increase the output level? I've only tried it with guitar since I do not have a bass, but I think that this is not affecting the big drop in volume. Since I couldn't find a dual C50k pot, I used a dual 100k linear pot with a 100k resistor added between the 1 and 3 lugs on both sides. This made the pot close to 50k and reverse log tapered, when checked with a multimeter. Could the total resitance and taper change, if I connect the pot lugs together as required by the layout? Increased the bottom right 47K resistor next to the IC. That will increase the gain of the final opamp stage. But if it's very quiet I'd still think there may be a bad joint somewhere or a bad connection or something. I've reflowed all the solder joints, and double checked for solder bridges. The volume drop is around 30-40%, and if I change the 47k resistor to a bigger value, the circuit starts a whistling noise as I turn up the boost/cut pot (kind of a feedback whine), the frequency of the whining can be changed with the frequency pot. The bigger the resistance the earlier the whining starts (with 68k resistor the feedback starts about 80% of the boost pot, with 100k resistor it starts about 60%). So I think the 47k resistor is the ideal one to use there. I tried this only with a guitar, maybe the volume loss is caused by the fact that this effect is tuned for a bass guitar, so maybe lots of the fundamental frequencies of the guitar is filtered out. When the freq pot is turned to the lower frequencies, there is no change in guitar tone, maybe it boosts freqs lower than the guitar can produce. I can onéy try this with a bass guitar next weekend, and if the volume loss is there too, then I will add a small boost circuit to it. I don't know if you colud tag it as verified. The layout is working, but I don't know yet if it is working as intented or not. Just measure the DC voltage between all IC and BS170 pins and ground. We can see if anything else obvious is amiss. I'm using a Boss PSU, it's 9.1V unplugged, when I plug it into the effect it drops down to 8.42V after the very first diode in the power line - is that normal? I've used 1N914 diodes. With a diode in series you lose the voltage drop of the diode, so yes that is expected. Pin 5 of the IC is looking suspicious to me. Check soldering of the 1M resistor, 100n cap and frequency pot connections for bad joints, and also check the cut between pins 4 and 5 is clean. During checking the components you mentioned, I found that I made a mistake and connected the rightmost 10uF capacitor's negative terminal 1 row lower (instead connecting to the 1M resistor's row it connected to the Boost 1 row). I corrected it, and the circuit working much better now. It's about at unity gain if I set the boost/cut pot to middle position and the trimpot to maximum output. It's a bit hard to tell, since I haven't put this into an enclosure yet, so no switch to quickly check on vs off levels. The voltages I measured haven't changed. Your voltages look ok to me. Is the effect boxed yet? I often get squeals and oscillation when testing effects before they have that extra shield to protect against it. The other thing to check is for a poor solder joint on the pots responsible. I don't hear a frequency change with the dual gang pot and I am sure I have it wired wrong. How are the lugs numbered ? Are the dual gang pots numbered the same way. which has me thinking: I've just looked at the schematic on FSB: isn't it the opposite??? B100K dual for frequency and C50k for cut/boost?? sure. why not? since it's made for bass it's designed to retain a lot of low end, so you may find it a little bassy. if that's the case you may want to make some modifications to make keep lessen the bass, which shouldn't be too difficult. Can i use 2N7000 to replace BS170? i see on datasheet looks similar. Thanks. hello. Friends the effect Works? hello IvIark.You may to show the connection of pot dual C50k. please. I dont understand how it connects. I'm confused on this one. Where is the Cut function on this vero board? 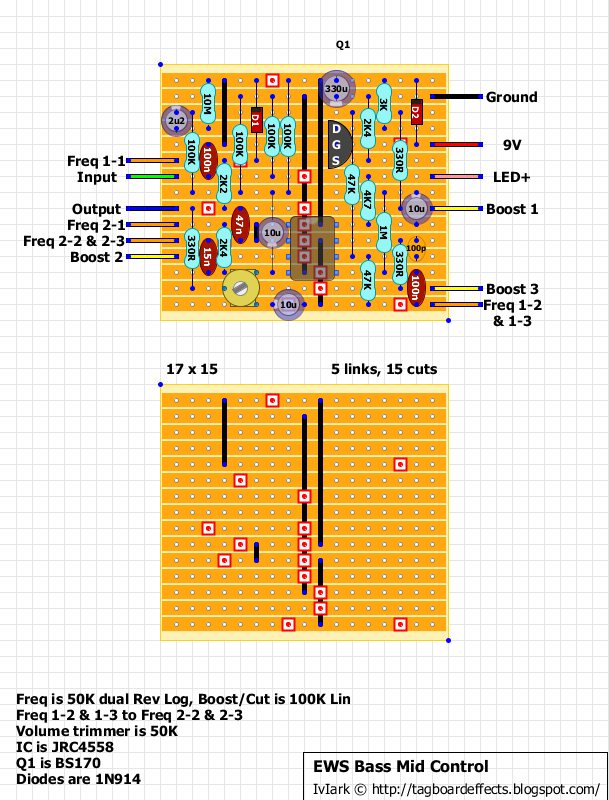 Why is the Freq pot dual but not the boost. Shouldn't the boost pot be a dual (with center dent) for Cut to the left, boost to the right, while the Freq Pot is just sweepable? Hey. someone have a PCB or Layout or schematic of Tri-logic Bass Preamp II or big box ? Thanks so much for the layout. I put this guy together using two slide pots because it was easier to find a dual pot in slide format. I'm really enjoying it. Sounds great! Gives my bass that little kick in the perfect mid frequency.